Falls cause bone fractures. So do accidents. A bone fracture is a medical condition in which a bone is cracked or broken. Many fractures result from high force impacts or stress. Bone fractures also develop from medical conditions that weaken bones, such as osteoporosis, certain types of cancer, or osteogenesis imperfecta (a condition causing extremely fragile bones). A bone fracture may be very painful due to the stimulation of nerve receptors, swelling, and muscle spasms. Since bone healing is a natural process, fracture treatment aims to ensure the best possible function of the injured part after healing. 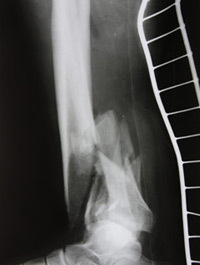 Typically, fractured pieces of bone are restored to their natural positions, with verification provided by an x-ray. A fractured limb is held in place with a plaster or fiberglass cast or splint. Once the initial swelling goes down the fracture may be placed in a removable brace. Surgery is done only if conservative treatment has failed, or is likely to fail. Surgery is routine on hip fractures due to osteoporosis. That’s because the complications of non-operative treatment includes deep vein thrombosis (the formulation of a blood clot in a deep vein) and pulmonary embolism (a blockage in an artery due to air, fat, blood clot, or tumor), which are more dangerous than surgery. When a joint surface is damaged by a fracture, surgery is also commonly recommended to make an accurate anatomical reduction and restore the smoothness of the joint.